The Texas Advanced Computer Center (TACC) has received $30 million in U.S. funding for a new supercomputer that will roughly double the performance of its existing 9-petaflop supercomputer. The new system, named Stampede 2 after its predecessor, is being funded by the National Science Foundation. It will be available for scientific research by June 1, 2017. The Texas supercomputing center occupies a unique niche. The U.S. government owns the nation's largest and most powerful supercomputers. The national leader is Titan, a Cray XK7 Opteron-based system at Oak Ridge National Laboratory, running at a peak performance of about 27 petaflops. 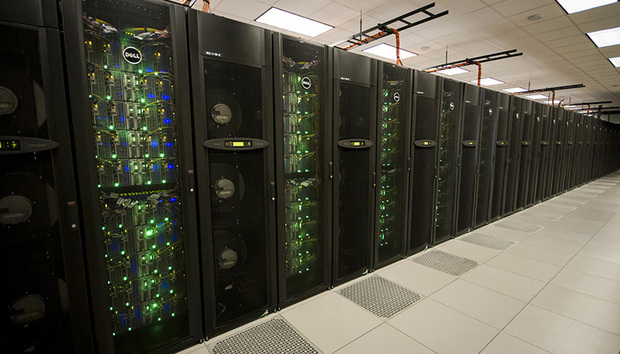 But TACC operates one of the nation's largest academic supercomputers, which went into production on Jan. 7, 2013. The original Stampede system ranked 10th on the latest Top 500 supercomputing list, released last November. Both U.S. and academic facilities conduct wide-ranging basic research in many of the same areas, such as climate and health. But U.S. national labs perform government-directed research, including those related to national security issues, nuclear research, energy, climate and biosecurity. NSF funds research efforts at universities covering every discipline imaginable and provides funding for HPC use. The largest academic system is the Cray Blue Waters system at the National Center for Supercomputing Applications (NCSA), University of University of Illinois at Urbana-Champaign. It is capable of 13.5 petaflops peak performance, but is not ranked on the Top 500 list. NCSA made a decision several years ago not to submit data to the Top 500, because of problems it has with the benchmarking system, Linpack, used to evaluate performance. Regarding Stampede II, "we anticipate it will be the biggest machine in a U.S. university by next year," said Dan Stanzione, executive director of TACC. Similar to its predecessor, Stampede 2 will use Dell servers and Intel chips. While work on Stampede 2 begins, the TACC is now upgrading Stampede -- adding 500 Knights Landing-based Xeon Phi systems, which can have up to 72 cores. With the Knights Landing chip addition, the aggregate performance of Stampede will theoretically be above 10 petaflops. However, the upgrade will be used to help start migrating applications to the new system. It won't be running jobs across the entire Stampede system. Stampede 2 will incorporate some of the latest memory advances, including the upcoming 3D XPoint non-volatile memory technology, about 1,000 times faster than NAND flash. There is considerable demand for HPC time from scientists. Although Stampede has run seven million jobs representing the work of some 10,000 researchers, the center still fields five times as many requests for time on the system as it can deliver, said Stanzione. The new machine will help meet this research backlog, said Stanzione. "We know the demand is out there," he said. Stampede 2 will mean higher resolutions and more accurate modeling for large runs. But smaller jobs, depending on how well they use memory and processing power, will completed more quickly. The node count between Stampede and Stampede 2 will be roughly the same, around 6,000 nodes. And while officials aren't sure of the final core count of the Intel processors, TACC is expecting each one-socket node to be capable of about 3 teraflops each. TACC held a dedication today for its newly expanded building, a $20 million, 38,000 square-foot complex. The new building is needed to meet the growing demand for HPC across a wide range of disciplines. "The more things in science that use advanced computing, the bigger our mission gets," said Stanzione.